Naqoyqatsi is the third and final entry into the Qatsi trilogy and is by far the most difficult and abstract of the three – and that is clearly saying something. Gone are the vast vista’s. Gone are the tranquil moments of serenity or grandeur. The subtitle of the film “Everyday is War” makes it perfectly clear, this will be more of an attack and in many ways the least ambiguous of the collection. From scenes of abandoned buildings to science labs, everything we see is cold and removed a step from reality. This is done by adding colour filters and twisting the raw footage into something slightly off centre. Whilst this may have been something quite marvellous back in the 90’s and early 2000’s when the film was eventually released after a long rambling, it doesn’t hold up so well now. With a more modern access to video editing software, it feels more like someone’s gone a bit mental with all the effects in photoshop. What it also does is age the film somewhat too – especially when the CGI mock ups and computer effects are being shown. They were dated on release and now they look a bit strange. This will put people off but some of it is so garish, it add’s the strange charm. However there are still some sublime sections. My favourite is watching crash test dummies in a plane crash in slow motion being sent to their death. Another section confronts media and how we are constantly bombarded with it all day, every day. It also constantly references how the march of data is like a march of an army too. Whilst the visual side of the film is visceral and intrusive, the musical side is the most cohesive of the series. Yo Yo Ma plays cello throughout the entire score. Ma’s playing is exceptional. Every drop of emotion is squeezed from that instrument and without it the film would be so much poorer. Infact it’s the glue to the whole movie. 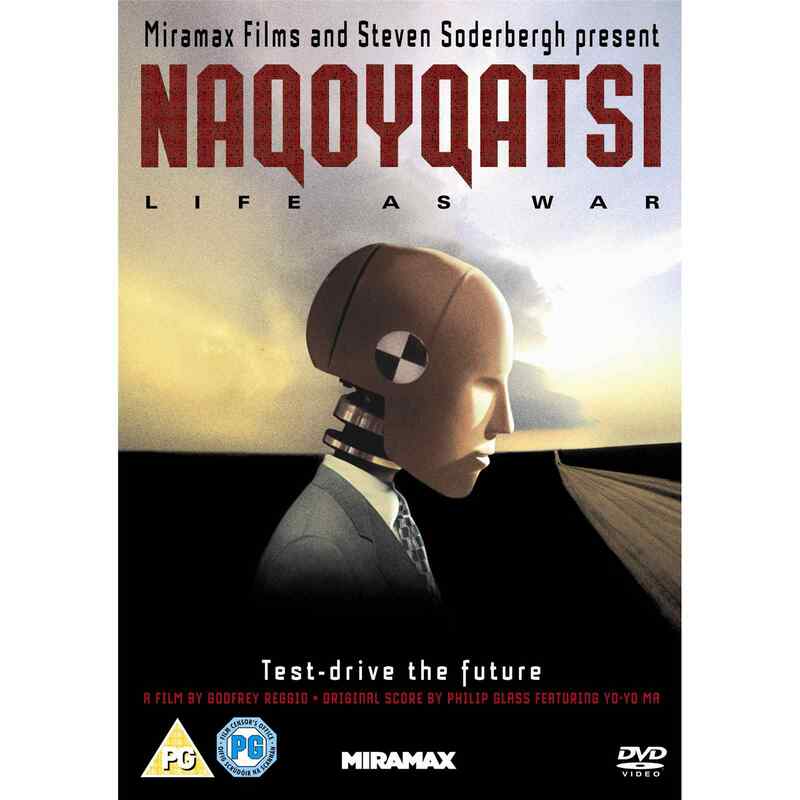 Naqoyqatsi is an awkward end to the trilogy but then that’s part of the point. It’s pessimistic, strange, detached and synthetic. The music feels like the humanistic element and it works best as part of the trilogy and not as a standalone film. Raggio at his angriest.